During the first week of September we reported that BMW is planning to bring new entry level models to its 3 Series and 1 Series line-up and also informed you that a number of improvements will be there in the 2013 model line-up. Talking in depth about BMW 1-Series, the very affordable entry level series has been added with the revolutionary xDrive system as standard. The new system guarantees optimized stability, maximum traction and improved sportiness for the 1-Series. 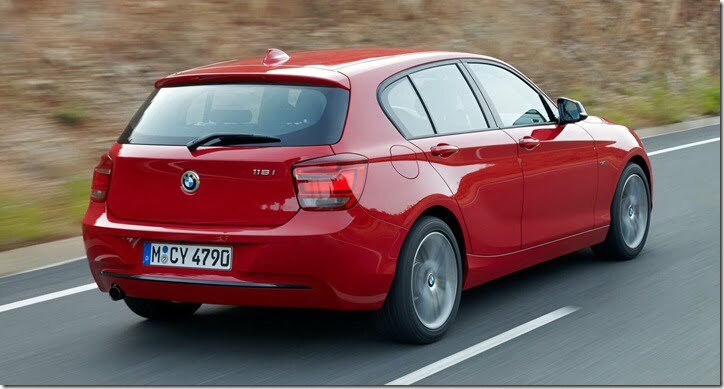 Moreover the company is expanding the 1-Series line-up and has added BMW 114d entry-level diesel variant. The new variant is powered by a 1.6 litre 4 cylinder twin turbocharged diesel unit that puts out a maximum power of 95 BHP at 4000 RPM and peak torque of 235 Nm between 1500 and 2750 RPM. The car has a top speed of 185 km/h and goes from 0 to 100 km/h in 12.2 seconds. 114d returns a beautiful 23 KMPL with respective CO2 emissions between 109 and 112 grams per km. Performance is the key feature of this new variant and to help it achieve such considerable level of performance, are a couple of features such as Brake Energy Regeneration system, Optimum Shift Indicator, Auto Start-Stop Technology, electromechanical power steering, active aerodynamics and reduced rolling resistance tyres, all of which are covered under BMW EfficientDynamics. Beside these technologies, the car also features ECO PRO mode that helps in maintaining a fuel efficient driving style. The car is available in both 3-door and 5-door variants and is available to order now. The price is yet to be announced and unfortunately it will not be available for the US customers. Production of the 114d is scheduled to commence from November 2012. Along with the 114d, the company has also added a new variant to the 3-Series line-up, BMW 316i. The 316i is powered by a 1.6 litre TwinPower Turbo petrol engine that delivers 136 BHP of max power and 220 Nm of peak torque. it returns a mileage of 17 KMPL and has CO2 emissions between 134 and 137 grams per kilometer. We will keep you posted on more details, stay tuned to Car Blog India for updates.